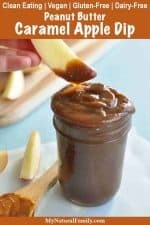 This healthy caramel apple dip recipe is as good as it sounds, is super simple to make, contains no dairy or refined sugar, and is Clean Eating, Vegan, Dairy-Free, Gluten-Free. The other day while mindlessly wondering around Target (one of my favorite activities), I came across a container of caramel peanut butter dip in the seasonal food section (Ummm. Yuuummey!). As I glanced at it, I thought it sounded insanely delicious, and then quickly moved on to the seasonal decor. After a little bit more browsing, I headed to the checkout feeling pretty proud of myself for only buying what I actually went there for – that never happens. I always seem to find something that I “need” when I go to Target. How do they do that? Anyway, when I got home, I couldn’t stop thinking about that dip. I finally broke down and created my own at 11 pm that night – and boy am I glad that I did. It tastes just as delicious as it sounds, came together super easy, and was much healthier than the store-bought version. How can you go wrong with peanut butter and caramel? You can’t. Plus this dip is made with all natural ingredients, healthy fats, no refined sugar, and is vegan…so eat up! I used this dip for my cut up apple, because that is what I had on hand, but it would be delicious with almost any fruit…or get creative. I don’t think it can taste bad on anything! I would love to know what you eat this with and what you think. Please comment below! 9 of the Best Easy, Cheap Clean Eating Appetizer Recipes! Store the dip in the fridge. It will harden in the fridge but can be reheated when ready to serve. This looks delicious! I always make caramel with dates but I will have to try this! When you say “coconut cream” do you mean the thick stuff that rises to the top of a can of refrigerated coconut milk? Or do you mean something else? Yes, that is exactly what it is. Occasionally I can find a can of coconut cream, so I don’t have to worry about refrigerating coconut milk, but I don’t go out of my way to buy it (I almost always use coconut milk – I like Thai Kitchen brand).